The machine can be equipped with an automatic tool loading unit, allowing 24/7 un-manned operation. The loader can be configured in different versions with 2, 3 or 4 pallets. Customized pallets can be provided upon request. 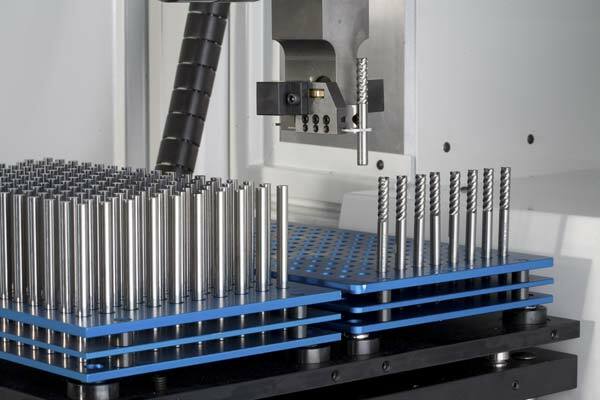 Standard pallets can accommodate up to 814 workpieces ranging from 1 to 16 mm, depending on the diameter. The loader is equipped with two precise CNC axes and with pneumatic swivel and clamping units. During a single loading sequence, a new blank is taken from the 1st pallet by gripper #1. It positions itself at grinding entry door and waits. Upon completion of the current grinding cycle, the tool loading unit enters the machine. The finished tool is removed from the collet by gripper #2. The new blank in gripper #1 is inserted into the collet and clamped accordingly. The complete gripper unit then exits the machine and places the finished tool into pallet #2.